A row between the EU and India over the transit of generic drugs through Europe has been resolved, negotiators told Reuters news agency. As a result of the deal at an India-EU summit in Brussels, an Indian complaint to the World Trade Organization will be suspended, India's trade minister said. But some fear the free trade agreement (FTA) at the core of the summit will hurt generic drug production. The FTA, one of the biggest of its kind, is due to be ready by the spring. India and Brazil brought a case to the WTO in 2009, accusing the EU of wrongly stopping and inspecting shipments of generic drugs in transit. Both Indian Trade and Industry Minister Anand Sharma and EU trade chief Karel De Gucht confirmed to Reuters on Friday that the transit dispute had been resolved. "This is a great breakthrough which will of course lead to a suspension of WTO proceedings, so the dispute is over," said Mr Sharma. Mr De Gucht said: "I reconfirmed we are going to amend present regulation so as to put into practice what has been agreed. "[Generic drug] transports in transit will no longer be checked, except for counterfeiting." The EU has still to negotiate with Brazil, Reuters adds. But medical charity Medecins Sans Frontieres (MSF) said the future of cheap Indian generic drugs for HIV/Aids and other conditions was at stake. Suggesting the transit issue was being used as a "smokescreen", MSF press officer Jean-Marc Jacobs told the BBC News website that: "The issue of drug seizures was only one part of the problem and many other issues remain." The most worrying issue, he argued, was "data exclusivity", by which monopolies on medicines could be extended and production of affordable, quality generic versions could be delayed for years. The UN HIV/Aids programme (UNAids) expressed concern on the eve of the summit about "trade agreements that place additional burdens on the manufacture, import or export of lifesaving medicines". It stressed that Indian manufacturers accounted for more than 80% of generic antiretroviral medicines, and supplied most developing countries. EU officials insist the FTA will not limit India's right to produce generic drugs and dismissed such concerns as scare-mongering. "We have no interest in preventing assistance to people who need drugs," said John Clancy, spokesman for Mr De Gucht. It would be inappropriate to discuss specific measures in the treaty before it was finalised, he was quoted as saying by the Associated Press news agency. In a joint statement, Indian Prime Minister Manmohan Singh, European Council President Herman Van Rompuy and EU Commission chief Jose Manuel Barroso said they looked forward to a FTA being concluded in the spring. 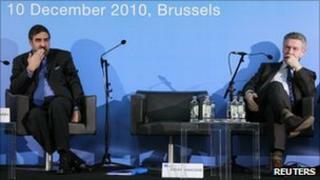 In a separate statement, Mr Barroso said "very important progress" had been made towards a broad-based FTA. Having agreed on its basic contours, the parties would work on "the final political push", he said. "This free trade zone will bring together markets of 1.5 billion people," he said. "It will be a key contribution to the global recovery and a signal for global openness and also a signal against protectionism," Mr Barroso added.